Coming from a family of artists, Dicksee shot to fame as a young painter of romantic and historical subjects, some of which were Pre-Raphaelite in character. During the late 1890s he turned to modern life subjects and became one of the principal exponents of the so-called ‘problem picture’, depicting domestic dilemmas. Throughout this time his portrait practice developed apace, and while subject pictures gradually fell from favour, his carefully plotted renderings of fashionable women replaced them in annual Royal Academy exhibitions. Essentially, this began with the portrait of The Duchess of Buckingham and Chandos, 1901-2 (Tatton Park, Cheshire). By 1905, E Rimbault Dibdin in his ‘Art Annual’ monograph on Dicksee, could quote a contemporary critic who dubbed him a ‘very adroit man-milliner’… It was however, Marion Hepworth Dixon who adroitly grasped the sense of direction in Dicksee’s work. Describing him as ‘a painter of modern life’ she remarked that ‘every great painter from Holbein to Sir Joshua drew the actual fashions of his own day’ and, ‘Every age has its own stamp and hall-mark. Its finger tracing is written on the lineaments of a face as it is in the fashioning of a garment. Our countenances may have neither the bold cunning of the Tudor times nor the lax grace of the Stuart. We have progressed, or imagine we have progressed a step further …’ This ‘hallmark’, Dicksee addressed in his pursuit of the ‘feminine loveliness’ throughout the rest of his career. By the outbreak of war in 1914 he had become the ‘pompadour’ portraitist of the day, and in the midst of reports of the German spring offensive on the Western Front in 1918, this supreme self-confidence radiated from the walls of the Royal Academy in the depiction of the spirited forty-eight-year-old Mrs Austin Mackenzie. Dicksee may not have encountered such truculence in the impish Mrs Austin Mackenzie; by 1918 he was after all, a well-established Academician who would, in a few years, assume the Presidency and as many critics attested, he was an exceptional technician, at home as much with fine fabric textures, tapestries and gilding, as with the delicate flush of local colour in flesh painting. His range, which included occasional landscapes, was immense, but by the time he elected the President of the Royal Academy in 1924, a new world had been ushered into place and the Salon heroines of the Edwardian years had become, in the winning words of Siegfried Sassoon, ‘fashion-dated ghostesses’. Like Virginia Woolf’s Mrs Dalloway (1925), their animating importance was slipping away. accuracy by Dicksee. The jewellery too, a brooch of aquamarine set in silver and diamonds at her breast, and a diamond butterfly in her hair, are either late-eighteenth-century or in the taste of that period, as is the small fan. Within the context of a world at war, might this image, redolent with nostalgia for the past, be seen not as escapism but a comfort, pleasurable on the eye? Fig. 2 French fan, c.1800. Fan Museum, Greenwich. Sir Francis Bernard Dicksee was the most illustrious member of the Dicksee dynasty of painters. He specialised in portrait painting and genre subjects inspired by Late Romantic themes drawn from the medieval age. The brothers Dicksee, John Robert (1817-1905) and Thomas Francis (1819-1895) were important mid-nineteenth century portrait and genre painters. Thomas had three children, Sir Francis Bernard (1853-1928), Margaret Isabel (1858-1903) and Herbert Thomas (1862-1942) who each became important artists in their own right. Sir Francis Bernard Dicksee studied first with his father, before enrolling as a pupil at the Royal Academy Schools for five years. Dicksee also had an important career as an illustrator of books and periodical magazines. He made his start as an artist providing illustrations to the Graphic and the Cornhill Magazine. He also illustrated novels and books of poetry such as Mrs Oliphant’s Within the Precincts and the epic poetry of Henry Wadsworth Longfellow, including Evangeline and The Four Georges in the 1880s. Many leading contemporary artists were to have an influence upon Dicksee, most importantly the late Pre-Raphaelitism of Sir Edward Coley Burne-Jones and George Frederick Watts. Like these painters, Dicksee adamantly rejected the modernity of industrial and mercantile Victorian Britain and sought to create a realm of archaising idealism in his works. Dicksee’s portraits of elegant contemporaries also strive after a mood of reverie and aesthetic beauty, while still conveying a vivid sense of the particular individual. 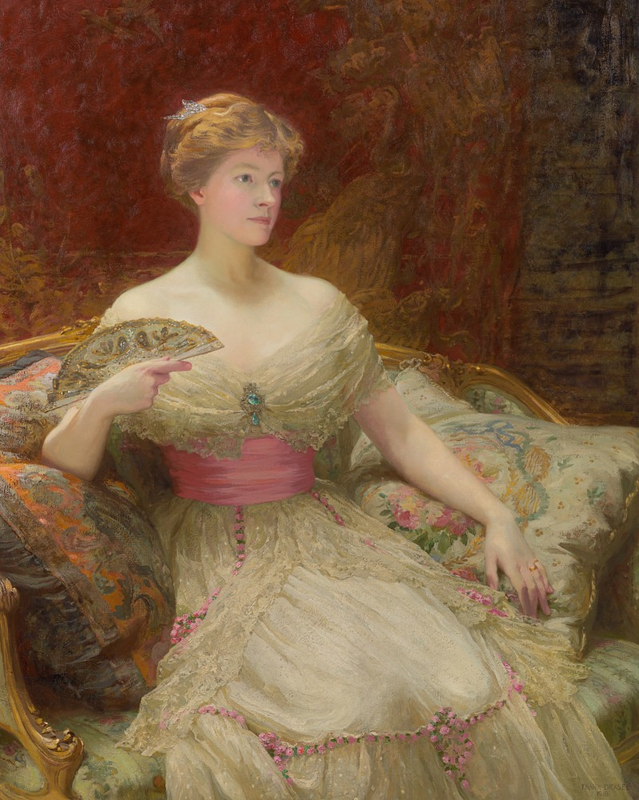 Dicksee contrasted his social portraiture, which celebrates the elegance of the Edwardian era in a graceful manner comparable to the work of his contemporary John Singer Sargent, with a number of genre paintings moralising upon the life of modern day high society, reminiscent of the works of Sir William Quiller Orchardson (1832-1910). Dicksee made his début at the Royal Academy in 1876. The next year he achieved the great honour of having one of his paintings, Harmony, purchased by the Chantrey Bequest, a fund set to purchase contemporary art of extraordinary merit for the Nation. Another of Dicksee’s paintings, The Magic Crystal, was also bought by the Chantrey Bequest He also exhibited at the Royal Society of British Artists at the Suffolk Street Galleries in 1872 and 1874. He had an international reputation and was awarded a silver medal at the Exposition Universelle held in Paris in 1900. Dicksee was to be an important force within the Royal Academy throughout his long life. Having studied at the Royal Academy schools as a young man, he was elected an associate in 1881 and a member in 1891. Dicksee was elected President of the Royal Academy in 1924 when he was seventy-one years of age. These artistic honours were coupled with royal recognition; he was knighted in 1925. King George V awarded him the honour of being Knight Commander of the Victorian Order in 1927. The work of Dicksee is represented in many museum collections including the Victoria and Albert Museum, the British Museum and the Tate Gallery, London, the Manchester City Art Gallery, the Leicester City Art Gallery, the Newport City Art Gallery, the National Gallery of Wales, Cardiff and the National Gallery of Victoria, Melbourne, Australia. The Tate Gallery holds Harmony, an allegory of music, painting and poetry in the late Pre-Raphaelite manner which was purchased by the Chantrey Bequest in its collection. For accounts of these see Toll 2016; also Austin Chester, ‘The Art of Frank Dicksee RA’, The Windsor Magazine, vol XXVII, 1907, pp.3-24. Dicksee’s first foray into portraiture came with The House-Builders, 1880, a double portrait of Sir WE Welby-Gregory and his wife, discussing the model and plans of their new house. E Rimbault Dibdin, The Art of Frank Dicksee RA, 1905 (‘Christmas Art Annual’, Virtue & Co), p.20. Marion Hepworth Dixon, ‘A Painter of Modern Life’, The Ladies Realm, vol 17, 1904-5, pp. 568, 572. ‘Mamie’ Mary Frances Mackenzie (née Linton 1870-1948), was the eldest of the three daughters of Captain James Henry Wingfield Linton. She actually placed a small add in The Scotsman 6 May 1913, p. 1 for a cook-housekeeper for residences in Argyllshire and the Isle of Wight. Unpublished memoirs of M. F. Mackenzie, 1943, vol III, pp. 56-57; quoted in Toll 2016, p. 177. Ibid. Apparently she was happy with her hand holding the fan as she always carried one in the evening. Quoted in Kenneth McConkey, Memory and Desire, British and Irish Painting at the Turn of the Twentieth Century, 2003 (Ashgate), p. 94. Siegfried Sassoon, ‘On Some Portraits by Sargent’, in Collected Poems, 1947 (Faber & Faber, 1984 ed), p. 153; quoted in McConkey, 2003, p. 85. George Moore, Modern Painting, London, 1893, p.99. Information kindly supplied by Clare Browne from the Victoria and Albert Museum. The decline in such hand-made needle lace was accelerated by wartime hostilities in lace-making areas and never really recovered. During the 1914–18 war (unlike the Second World War), clothes were not rationed, in order to keep up morale, especially for the troops returning to Britain on leave.